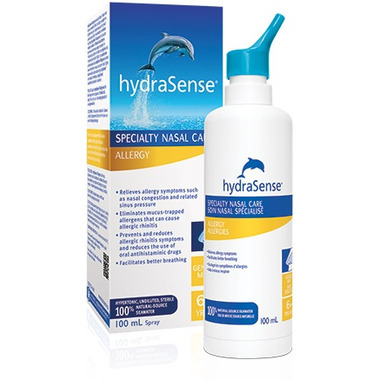 hydraSense Allergy Specialty Nasal Care Allergy relieves nasal allergy symptoms such as nasal congestion and related sinus pressure, without medications! Trust hydraSense® Allergy to help eliminate those mucus-trapped allergens and help you breathe better. Apply 1 spray of hydraSense Allergy in each nostril by depressing the nozzle up to 3 times daily, followed by blowing of the nose for desired relief. For children over 6 years of age and adults. You may experience a temporary tingling sensation if mucous membranes are irritated. Store between 0°C and 30°C. Been using this nasal spray for years. Best solution for dry, stuffy, runny, congested noses, especially due to allergies. Great product! Really helps with my allergies!